YES Herbal contains these powerful herbs. Sheep Sorrel – This herb is rich in vitamin A, B-complex, C, D, K, and E. Its minerals include significant levels of calcium, iron, magnesium, silicon, sulphur, zinc, manganese, iodine, and copper. This herb has been reported to aid in a wide variety of skin disorders as well as aiding in digestive disorders. Sheep sorrel is also rich in chlorophyll. Chlorophyll increases oxygen content in the blood. This herb is also rich in potassium oxalate. Cat’s Claw Bark – This herb is effective for treating a variety of digestive and upper respiratory disorders. It’s great for circulation. Slippery Elm Bark – This herb is a natural antibiotic and has exceptional cleansing properties. It helps coat and lubricate the artery wall, which helps blood flow. It has also been shown to protect membrane linings in the joints and can provide relief of inflamed areas. Chinese Rhubarb – This herb has been used in China for more than 2,000 years. It has very impressive detoxifying properties. This herb also has antibiotic and anti-microbial properties. This specific combination of herbs is in a "league of its own." Unlike most commercial herbal supplements, YES™ Herbal is produced in small, limited quantities. The herbs have no pesticides and are certified organic. We have these incredible herbs produced in pristine parts of the world ideal for each herb. There is limited worldwide supply of this level of herbal excellence. Surprisingly, when it comes to herbs, the exact place they are grown makes all the difference. After harvest, the herbs are dried for the capsules or carefully brewed, and blended to our specific formula. Just one capsule a day is all you need. Our specialized Herbal formula is extremely effective, so a little goes a long way! 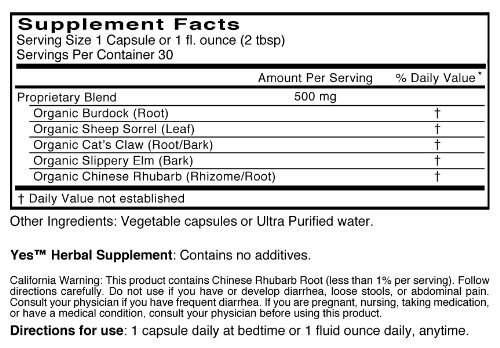 NOTE: This product contains Chinese Rhubarb Root (less than 1% per serving). Follow the directions carefully. Do not use if you have or develop diarrhea, loose stools or abdominal pain. Consult your physician if you have frequent diarrhea. If you are pregnant, nursing, taking medication or have a medical condition, consult your physician before using this produce.